When it comes to managing the gunk and build up in the water of your tank, protein skimmers are an essential tool of the trade. A fish tank protein skimmer is the device that’s going to keep the water healthy, manage bio slick, and keep the filter churning towards doing its job as a cleaning device. There are small protein skimmers, cheap protein skimmers, saltwater protein skimmers, you name it. But picking one at random isn’t the best way to go about it. You need to do research on your own tank before committing to a protein skimmer. There are options galore out there. This list already narrows down at least one for you with the water capacity levels. This list is for the best protein skimmers designed for fish tanks between 40 gallons and 75 gallons. Right there you’ve already got a great parameter. So if your tank doesn’t match that, move on to one of our lists that does. But keep going if you’re in the right spot. Next there are some things to consider for your protein skimmer setup: noise, weight, size, whether it’s a hang on or separate piece. All these terms will become clear as you work through this buying guide. Like anything else, there are some safety things you need to consider while searching. The current of your pump matters a great deal, how strong or weak it is can be the difference between life and death for your fish. 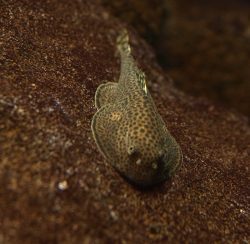 You’ll also want to look at how the noise and vibrations of the skimmer can affect your fish, how effective it is at doing its job, and some other facets. The answers for all of this will be below, so get reading! The HOB Protein Skimmer has the look of the whole package when you first see the full skimmer ensemble. It’s got a Sicce Syncra 1.5 pump with a power consumption of 11 watts and can handle anywhere between 50 and 75 gallons of water in a tank. 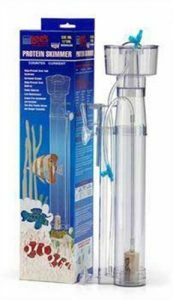 It’s a submersible pump and, this is important, is designed specifically for saltwater fish tanks. It’s 23 inches by 13 inches by 8 inches and weighs 7 pounds, which is a bit much for a protein skimmer but it’s designed for a medium size tank so the bulk is going to get bigger as well. It’s got easy set up and maintenance and it’s designed specifically with hobbyists and amateur fish keepers in mind. So if you’re just beginning in the hobby of fish keeping, this might be a great start for you. The downside is this protein skimmer pump’s abilities as a hang on protein skimmer. The hang on bracket is known to fail so you’ll want to keep an eye on it and reinforce it as needed. The directions to set this tank up can also be a bit difficult to get through for first time buyers. 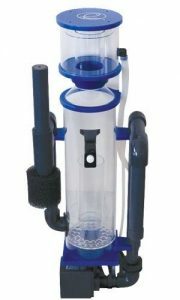 The Coralife protein skimmer is another one that does its best to have the entire package included in its kit. It utilizes a patented needle wheel aspiration system and wide neck collection cup that has an easy twist feature for ease of cleaning. 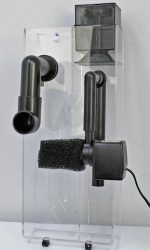 The bubble production diffuser prevents the flow of micro-bubbles into the main aquarium while continuing the job of the protein skimmer. This is another heavier kit weighing just over 7 pounds but, again, weight and bulk comes with more tank to clean. This one can be used with a sump or as a hang on with a mounting bracket. There’s also dual injection inlets to increase bubble/water contact time and improve the overall filtration process. The drawback for this one is, once again, hard to understand instructions, especially for beginners. There is also the functional issue of there being some overflow problems that can happen so monitor it closely for such issues. This protein skimmer is uniquely designed to be compact in its overall set up. It’s designed for saltwater tanks and includes an air silencer for quieter filtration as to not disturb you or the fish residing in the tank. The pump uses 28 watts of electricity which is a bit more than other pumps on this list. It’s a lightweight pump at 3.2 pounds and is ideal for water levels of up to 7 inches. As the name suggests, it’s designed to work ideally with up to 65 gallon tanks. 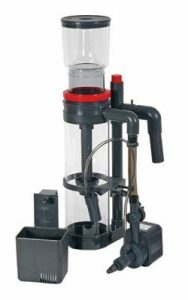 The removable cup is convenient for cleaning and a liter/hour flow power head pump is included in the kit. 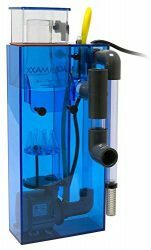 The Tunze protein skimmer for aquariums 15 to 65 Gallons, at first glance, is most notable by its muted and sleek design. Unlike many other pumps it’s not obviously a contraption used for cleaning up the water. So if you want something that doesn’t like a robot device, this isn’t a bad option to start out with. It also includes surface intake and flash skimming for quick cleaning when needed. It’s another one that’s lightweight at 3 pounds. The water acquisition system is a patented Tunze Flash Skimming Principle that pulls from the surface with fast and effective suction. Because of this, it’s branded as a “stand alone” solution for skimming in the tank. It generates large volume bumbles and utilizes sound dampening technology. It’s got magnetic holders to keep it in place on the glass. There’s a massive choking hazard on this model so keep an eye out of you have children who will be near this device or maybe a little grabby. The other big drawback is that it can be short lived if used a lot so keep an eye on the overall life expectancy of this pump. This is a small, compact protein skimmer, though right off the bat that tells you that not everything you’re going to need is included in this one. It does, however, include a two-way plastic valve and hanger for installation. The skimmer comes preassembled with the parts included and it’s designed for a tank of up to 50 gallons of water. This is very lightweight at 14.4 ounces and, is ideal for saltwater and reef tanks. It works to cut down on toxic tank syndrome and focuses in on organic waste and cleaning it as quickly as possible before it turns toxic. It’s a good first time buy for a protein skimmer. That all being said, you can take one look at this one and see that it’s one of the cheaper options out there and you’re going to get what you pay for. It’s a good beginner pump but not for long term or heavy use. 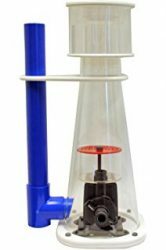 The Eashopps protein skimmer is designed for aquariums between 10 gallons and 75 gallons which gives you a massive range to work with if you ever want to upgrade or downgrade your tank size while still using this same protein pump. It’s external with a removable collection cup and bubble plate for easy maintenance and cleaning. It’s also got a silent running Sicce pump for the best quality of both you and your fish. It weights just under 6 pounds which puts it in the middle of our weight spectrum on this list. It’s designed to keep the tank clean at the same level as a natural shrimp in the tank would and it utilizes an aroma and flavor enhances to keep the fish happy and calm while it’s in use. The drawback to this skimmer is that it has been known to both leak and overflow so you’ll want to keep an eye on it and make sure it’s installed properly before turning it on and leaving it to its own devices. This design is easily the largest and most cumbersome of the ones we’ve seen on this list. It includes an Odyssea 250 pump and is designed for tanks between 50 and 70 gallons. The installation style is hang on at the back of the tank and needs a minimum clearance of 5 inches. It weighs 7 pounds so, despite a bulky appearance, it’s not any heavier than others on this list. 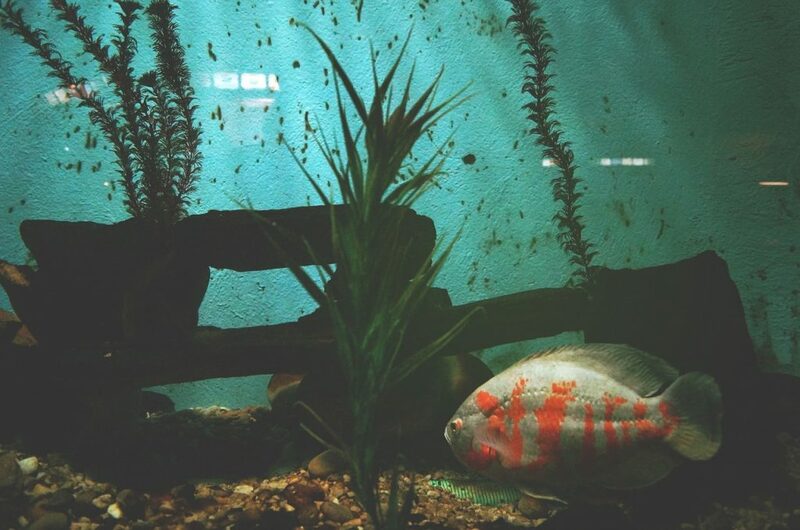 The instillation process is easy and the overall system of sucking in water, sending it through the bio chamber, and returning it to the aquarium is simple and effective. The drawback for this one is that the air pump sometimes needs help when it comes to drawing air into the filter. You might need to do some extra instillation steps to make sure it works properly. We also recommend check on it if you start to hear unusual noises, which may indicate sucking in air into the filter. 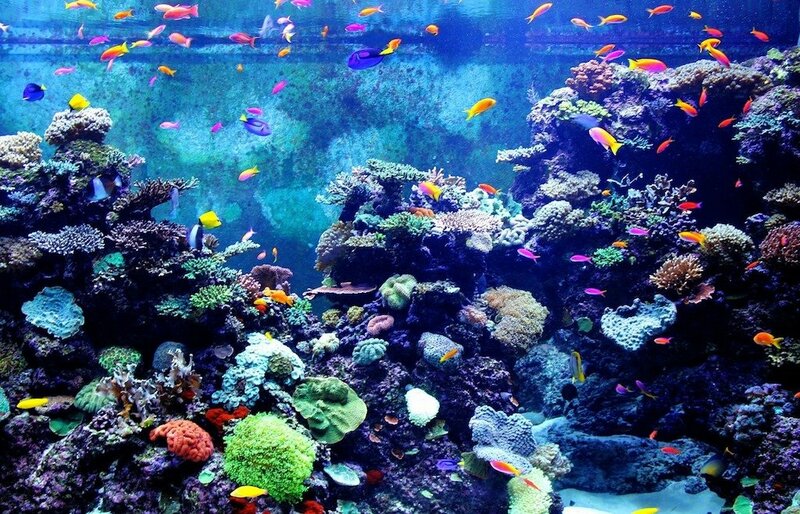 There’s a lot that goes into keeping a fish tank a safe environment for the fish living there and few components are as important as the aquarium protein skimmer for saltwater fish tanks. You want to take time and care to make sure you’re buying one that’s going to work best for you and your fish. This means checking for listed faults, noise levels, currents, and any other facets available on this list. 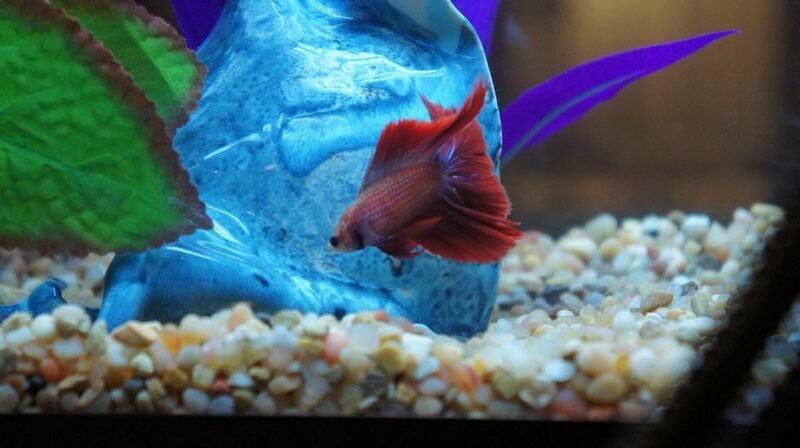 There are many protein skimmers for sale, so watch for warnings and drawbacks while going through this list and get yourself the best protein skimmer option you can to make a happy home for your fish! Let us know in the comments if you have any questions or comments about any of the protein skimmer for 75 gallon tanks listed.